The next Golf will have a three-door variant because it's a key entry-level model in Germany. Pictured is the current Golf three-door. 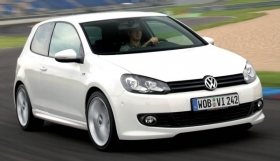 Bucking an industrywide migration to five-door hatchback body styles, Volkswagen AG will continue to offer three-door Golf hatchback models when it introduces the seventh-generation Golf in 2013. The Golf will have a three-door variant because it's a key entry-level model in Germany and it provides a platform for the sporty GTI, said VW Group Design Director Walter De' Silva at the Paris auto show last month. Audi AG also will have a three-door model in its redesigned A3 lineup, which debuts next year, De' Silva added. And VW's Seat brand is considering a three-door model when it replaces the five-door Leon compact, he noted. VW's product plans contrast sharply with rivals -- such as Fiat S.p.A., Ford Motor Co., PSA/Peugeot-Citroen SA and Hyundai Motor Co. -- that favor either five-door hatchbacks or three-door models with coupe styling. Hatchbacks remain the dominant body style in the compact segment in Europe, accounting for 75 percent of segment sales. But three-door variants have declined from a 12 percent segment share in 2008 to just 8 percent this year. Automakers have responded accordingly. For example, PSA will discontinue its slow-selling three-door Peugeot 308 when it replaces the five-door model, said PSA brand chief Jean-Marc Gales at the Paris auto show. Likewise, PSA did not replace its three-door Citroen C4, he noted. When Hyundai replaced the Accent with the i30 in 2007, it did not produce a three-door hatchback. Sales did not suffer at all, said Allan Rushforth, Hyundai Motor Europe's vice president. The company sold nearly 100,000 i30 five-door hatchbacks and wagons in Europe in 2009. This year, i30 sales have grown 25 percent even though industry sales in that segment fell 2 percent, Rushforth said. Other companies are taking similar action. Fiat introduced a five-door-only Bravo in 2007 as well as a five-door only Alfa Romeo Giulietta this year. Meanwhile, Ford introduced a five-door Focus ST performance model at the Paris auto show. “The three-door in conventional execution is considered too mainstream by customers who are looking for more sporty body styles,” explained Gunnar Herrmann, Ford's vehicle line director of C (compact) cars. In an effort to rekindle demand, some automakers are redesigning their three-door models to look like sporty coupes. Renault SA and Opel/Vauxhall were among the first automakers to offer a coupe-like three-door model. Renault did so when it introduced the Megane in 1995, and continued the trend when it introduced the third-generation Megane last year. 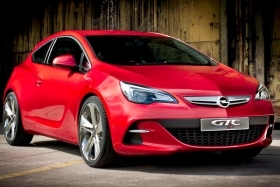 Opel took the same approach when it unveiled the three-door Astra GTC in 2005. At the Paris auto show earlier this month, Opel showcased a concept for the GTC replacement. Some automakers are redesigning their three-door models to be sporty like the Opel Paris GTC concept, shown. The automaker does not see the Paris GTC concept as an Astra three-door, said Opel Design Director Mark Adams. "It's a coupe with space for five people," he noted. Toyota said its three-door Auris variant covers just 5 percent of the compact hatchback's sales but declined to discuss its future model strategy.